Even Ibn Taimiyyah admits that the structure over Prophet Ibrahim’s (a.s.) grave existed when Islam reached Hebron and in the very presence of companions, none of whom raised any objection. Only thing is the door to the mausoleum (of Prophet Ibrahim (a.s.)) remained closed till 400 AH. Initially the Prophet’s (s.a.w.a.) room where he lies buried did not have walls. It was Umar b. Khattab who first constructed walls around it and gave it the shape of a structure. In fact, constructing and re-constructing walls around the Prophet’s (s.a.w.a.) grave was an ongoing effort with Ayesha, Abdullah b. Zubair (during his brief reign in Medina) and Mutawakkil, among others. If leveling graves to the earth was ever mandated in Islam we can be certain that Haroon al-Rashid would definitely have done it given his animosity with the Ahle Bait (a.s.) of the Prophet (s.a.w.a.) 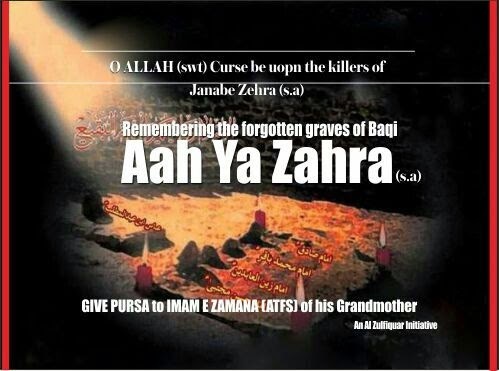 and his role in the murder of the Prophet’s grandson – Imam Moosa b. Jafar al-Kazim (a.s.). On the contrary, we find that he has constructed a dome as a mark of respect for someone who he did not particularly love. When this is the respect accorded by the Muslims to the grave of a companion who died on falsehood, graves of those like the Imams of the Ahle Bait (a.s.) who were martyred on truth and were in fact Imams of truth, deserve even more embellishment, veneration and respect. While these Muslims are quick to advance traditions from Sahih-e-Bukhari and Sahih-e-Muslim that suit their motive to brand accepted Islamic practices as apostasy, they appear oblivious to the scores of other traditions that reject their contention. When Umar was stabbed, he sent his son Abdullah with a message to Ayesha to – ask her – If I can be buried with my two companions i.e. in her room, next to the Prophet (s.a.w.a.) and Abu Bakr. Ayesha replied: I wanted the spot for myself, but I will prefer him (Umar) to myself today. It had been her custom that if a man from among the companions requested her for that spot, she would always refuse. She herself gave the following instructions before her death: Bury me with my lady-friends (the wives of the Prophet in al-Baqi but do not bury me with the Prophet in the house, for I dislike to be held in reverence). The detailed report states that the Holy Prophet (s.a.w.a.) asked a man to place a rock on top of Usman b. Maz`un’s grave; when he was unable to move it, he rolled up his sleeves and helped him till the whiteness of his arms was visible. Usman b. Maz`un was the first of the migrants buried in Baqi. Ibrahim, the Holy Prophet’s (s.a.w.a.) son, was buried next to him. These references are clear evidences for raising the grave and elevating it above the surface of the earth. Al-Shawkaani, a leading Salafi scholar, admitted that the Salaf built up the graves high as proved from above references. It is clear from the Holy Quran and the Prophet’s (s.a.w.a.) Sunnah and actions of the righteous ancestors that building of graves is permitted and even recommended in case of esteemed personalities. Then, how does one reconcile the apparent prohibition in some traditions? The answer is simple for those who understand the tone and tenor of such traditions. Many scholars have explained it in their works – only if these so-called Muslims would have referred to these books. Perhaps, they have referred but chose to hide the truth! Both the Ibne Hajars (Haythami and Asqalaani) among other scholars have advanced a rationale for such traditions, which is so plain that even a Muslim child will understand it. This was the method of the prayers of Jews and Christians and hence the prohibition. No one in the history of Islam took this tradition as proof of prohibition for the building of tombs/shrines over righteous Muslims as Muslims do not worship in this manner.